Clinton and Trump Are Historically Unpopular. Here’s Why. One of the most common stats trotted out in this presidential campaign is that presumptive Republican nominee Donald Trump and Democratic nominee Hillary Clinton are the most unpopular candidates in modern history, with more voters saying they have an unfavorable view of the candidates than a favorable one. Indeed, 23 percent of American voters we polled have an unfavorable view of both Clinton and Trump. At Morning Consult, we wanted to find out why. So we asked voters who had an unfavorable view of either Trump or Clinton to pick the top two reasons they dislike the candidate from a list of more than a dozen negative attributes. What we found is that the main drivers of Clinton and Trump’s unfavorable numbers play in to larger campaign narratives: Voters think Trump is racist, and Clinton is untrustworthy. Even more importantly, both are underwater in almost every state. The results below provide an in-depth look into the study and the challenges ahead for both campaigns. You can see more about our methodology below. For voters who have an unfavorable view of Hillary Clinton, their dislike can be boiled down to one word: trust. Almost half (47 percent) of voters who have an unfavorable view of Clinton don’t think she is trustworthy and almost four in 10 voters (39 percent) say she is corrupt. As former first lady and secretary of State, Clinton has long been in the public eye and attacks by Republicans over the years have resonated with voters. Their most recent Clinton criticism has been focused on her use of a private email server while secretary of State and her refusal to release transcripts of paid speeches she gave to investment banks on Wall Street. It’s little surprise that 50 percent of Republicans say she is untrustworthy, but that was also the top reason for 47 percent of independents and 39 percent of Democrats who have an unfavorable view of Clinton. Republicans and independents, at 45 percent and 39 percent, respectively, also believe she is corrupt, compared with 25 percent of Democrats. A little over one-fifth of voters (21 percent) said Clinton changes her positions when it’s politically convenient. At 26 percent, Democrats were slightly more likely to criticize Clinton for that reason, compared with 23 percent of independents and 18 percent of Republicans. Other main criticisms of Clinton also point to concerns often raised against a career politician: 12 percent of voters say she is out of touch with average Americans and says one thing but does another, and 10 percent of voters said she doesn’t share their values. Democrats (16 percent) were most likely to say she is out of touch with average Americans, while Republicans (14 percent) were most likely to say she doesn’t share their values. Morning Consult surveyed 2,001 registered voters from May 27-30, 2016, asking voters with an unfavorable view of either Hillary Clinton or Donald Trump to pick the top two reasons they dislike the candidate from a list of more than a dozen negative attributes. The survey was conducted online and the data were weighted to approximate a target sample of registered voters based on age, race/ethnicity, gender, educational attainment, region, annual household income, home ownership status and marital status. To construct the state-by-state analysis, Morning Consult asked nearly 40,000 registered voters from April 2016 through June 2016 whether they had a favorable or unfavorable view of Hillary Clinton and Donald Trump. We used a statistical technique called multilevel regression and poststratification (MRP) to construct state-level estimates from the national survey data. You can read more about MRP in this study here. 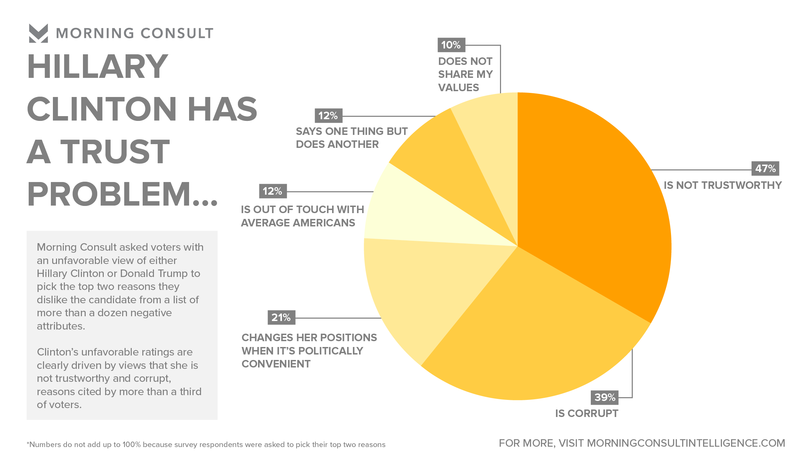 All data is available in Morning Consult’s research database, Morning Consult Intelligence.